It looks, smells and feels great, but some cut corners dull its shine. Read this site for long enough and you'll know I have a crazy love for ostentatious mechanical keyboards. The madder the design, and the louder its keys, the more I'm enthralled, and Azio's latest offering is a real doozy. 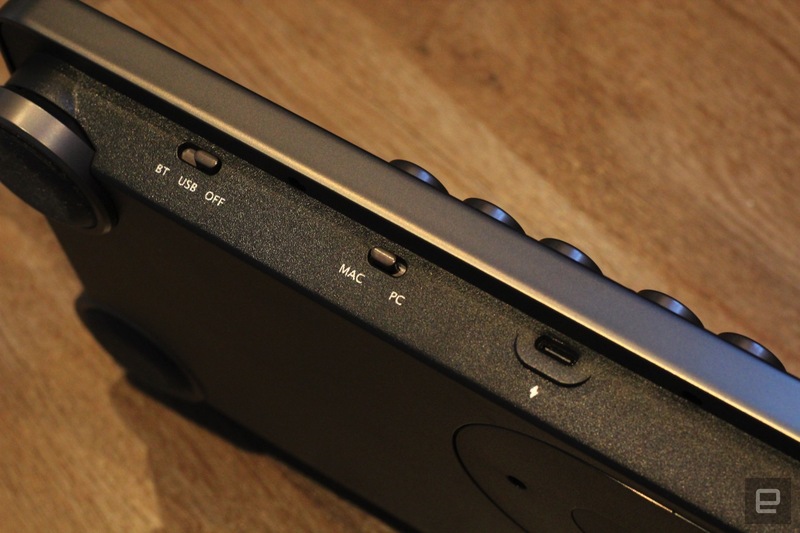 The Retro Classic is a USB or Bluetooth-equipped input device styled to make a steampunk faint in admiration. And even though I have no particular affiliation for that lifestyle, I love having it on my desk. The first thing to say about the Retro Classic is that it looks like it was built in the 1920s by a coterie of cloth-hatted civil engineers. If you're looking for something quiet and lightweight, this is the opposite, weighing in at a divinely heavy four pounds, clad in zinc aluminum with either a gunmetal or copper top. It's sufficiently hefty that I'd be tempted to use it in self-defence against an armed burglar. There are four chunky rubber feet below the keyboard itself and the back two can be twisted to lift it up. As the name implies, the Retro Classic is modeled after vintage typewriters with a mechanical hammer action. The switches in this case are produced by Kailh, aping the style and technology of the more well-known Cherry MX. Purists prefer the latter for serious, heavy-duty eSports, but Kailh's switches will do for pretty much everyone else. There's an excellent amount of travel and resistance, and a beautifully loud click when you reach the bottom of each key. 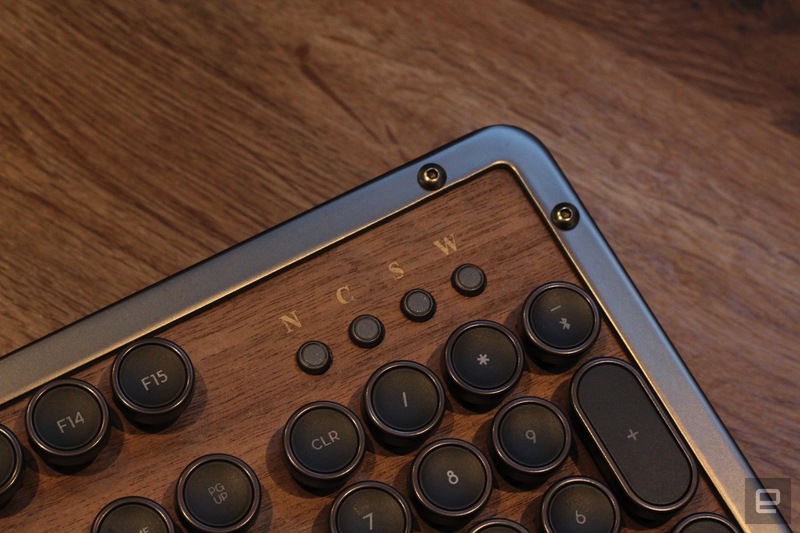 The custom-made semi-transparent keycaps are rounded and spaced a couple of millimeters from one another, tighter than comparable old-timey keyboards. The tradeoff between space and compactness is always the amount of errors you're likely to make. And certainly, the learning curve is steep if you're coming from another keyboard, but it's nothing too egregious. In the first week or so of testing, the worst thing I did was hit the keyxap next top the one I wantedf. Speaking of the keycaps, the unit comes set up for a Windows PC, so if you're looking to run it with OS X, you'll need to set aside 10 minutes. A bag of OS X-related keys are included in the packaging, along with a cleaning cloth, and you'll be tasked with pulling off the existing caps. Fortunately, the keys can be pulled off pretty easily and pushed back on without the need of an additional tool or any sweat. One of the big selling points for the Retro Classic is the use of natural wood and leather in its construction. The look, feel and smell of this thing is amazing, especially the Artisan with its leather topper. In fact, everything about this keyboard screams luxury, including its six-foot-long USB A to USB C cable: a godsend if you're rocking a standing desk. If I have a niggle or two, and of course I do, it's that I have a sense Azio narrowly missed its chance of making my perfect keyboard. The keycaps are just a little bit too flimsy for a product as ostensibly premium as this one, and that's a problem. The same goes for the screen-printed letters above the status lights in the top right-hand corner. The choice of serif font and the way it's been applied is totally inconsistent with the sans-serif letters on the keys themselves. And it's details like that which matter when you're spending more than two benjamins on a keyboard. Azio is selling the Retro Classic for $220, or $190 for the wired-only version. 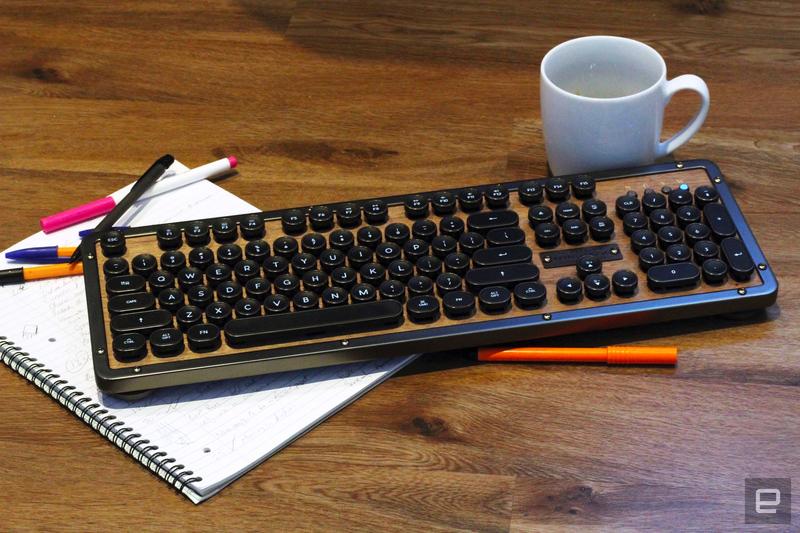 Having one of these on your desk is a delight, and it's a keyboard that makes you more considered about how you type, and what you're typing. I feel distinctly more hip having it on my desk, and it's fortunate nobody checked my hip quota before sending it over. But like all luxury keyboards, it's a conversation piece, something that's distinctly nice to have, rather than something that's essential. You can pick up a decent keyboard for $10 -- but this is the thing you buy when you're making a statement. Do you need it? No, never. Do you want it? Of course you do, and it's a joy to type with as well. It's the same logic that applies to a first-class plane ticket or those limited-edition kicks you waited all night to buy. The question in all those scenarios is the same: Do you have that sort of money to burn?